As a dentist, you're not just running a practice; you're running a small business. That means that success is predicated on doing a lot of things right beyond caring for teeth. Having a good website is one of them. Being a dentist doesn’t make you a good marketer, and it doesn’t necessarily make you a terrific entrepreneur or a web site designer. A good website won’t guarantee that they’ll come or that they’ll stay, but a bad website can create a significant obstacle to patients who might otherwise happily visit your practice. An effective website will create an accurate picture of your practice and the services you offer. It will also make your practice an inviting atmosphere. First impressions can be impossible to reverse, and in today’s wired world, patients are highly likely to have visited your site before ever stepping through your door. 1. A professional look and feel. You don’t have to pay thousands or tens of thousands of dollars to an agency to design your website, but you should have a site that looks like you did. If your college student nephew has some mad web skills, feel free to tap into them. Just make sure your site doesn’t look amateurish or poorly thought out. Yes, even great dentists have bad websites, but patients looking for dental care want a professional through and through. 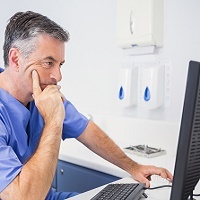 Broken links, misspelled words, and bad functionality—all at the tip of a patient’s fingertips—can be more damaging than having no site at all. 2. A proper introduction. Most patients take it for granted that you’ve been through dental school and have all the proper certifications and training to perform the services your site says you can do. When they search your site, they’re looking to see if there’s someone behind the tooth sign in the lawn that they can trust. Consider an introductory video starring you and your staff, perhaps with a glance at the crisp, clean, professional dentist’s office you are undoubtedly running. The video doesn’t have to be Citizen Kane or Star Wars, with the names of the film’s director and stars swooshing in on impressive graphics. Keep it simple, and keep it personal. Talk briefly about what you like about being a dentist, and what you hope to provide to your patients. 3. Your phone number and e-mail address—prominently and everywhere. Once you have them, you want your future patients to be able to contact you as efficiently as possible. Make it incredibly easy to contact you, with contact information not just on the “Contact Us” page, but on every page, in every header and footer, and in every sidebar. 4. Content that can be minimal but should be updated…frequently. You don’t need to post whitepapers, dental cleaning tips, and your recommendations for the best foods to preserve enamel to have an effective site. But make sure any information you do have up on the site is updated regularly. If you have a blog, customer testimonials, or a news feed—all updated in 2003—what does that tell your patients about your credibility, timeliness, and professionalism? Their fears may be unfounded when it comes to your practice, but patients can only judge by what they see. Make sure they see a website that looks like an ongoing concern. 5. A simple call to action. This is Marketing 101, but you’d be surprised how many websites don’t ask for the business or have a clear course for potential patients to follow. Make sure your multiple mentions of the contact information include an urge to actually use that contact information! “Call today for an introduction,” “Visit us anytime during office hours for a tour,” or “Schedule an appointment today!” aren’t complicated calls to action, but they simply work, through a combination of introducing an action that you want patients to take and then reinforcing that action. It’s subtle, but the power of suggestion really does work. As a dentist, you’re not just running a practice; you’re running a small business. That means that success is predicated on doing a lot of things right beyond caring for teeth. Having a good website is one of them.